Orbital Medicine | Assisting in the development and testing of medical devices and concepts in the microgravity environment. Orbital Medicine successful completes research experiment on the first commercial launch of the Blue Origin New Shepard rocket. You can see the press release here. We can provide highly skilled and experienced health professionals for your aerospace needs. We have extensive resources to assist you with aerospace emergency medicine response capabilities, operational support, consultative expertise, medical examinations, emergency medical planning, and medical monitoring. 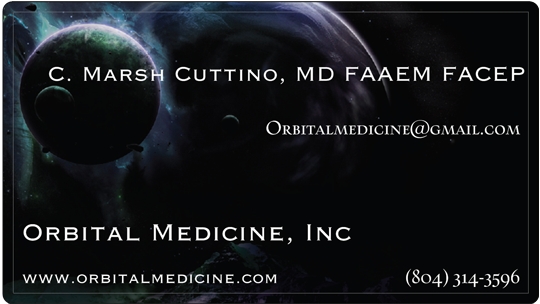 The members of Orbital Medicine have direct experience as providers and researchers in the aerospace environment. In the past they have provided launch and landing support for the NASA Space Shuttle at Kennedy Space Center and participated in research in the microgravity environment on parabolic aircraft. All members of Orbital Medicine are Board Certified in Emergency Medicine and are current practitioners in Emergency Departments around the country. We are the doctors you get when you call 911.